Below you can read the review of the TRON: Legacy by FILMCLUB member Lauren Howitt aged 11 from Yenton Primary School in Birmingham. The film is about the son of the world’s leading virtual world developer whose father, Kevin Flynn disappears unexpectedly. Twenty years later, Sam, Kevin’s son, explores his father’s arcade finding the game of TRON, one of his favourite games as a child. After trying to play the game and the coin being rejected, Sam finds a hidden passage way, and, following his instinct, creeps through it. 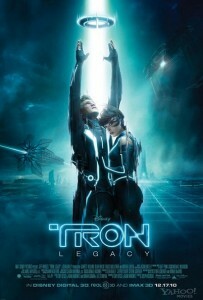 In there, he discovers a system which, when he hacks into it, transports him into the digital world of the game; TRON!!!! While inside the game, he finds the place where his father has been living for twenty years, and discovers his dad’s created duplicate, Clu has turned his back on his creator. Now, Sam has to try to save his dad and Kevin’s program assistant, Quorra, and help get them to the real world by racing against the clock and getting through the portal which can only be opened by the outside and will be closing soon. Meanwhile, Clu is doing all he can to retrieve Kevin’s disk and become the controller of The Grid. Will Kevin, Sam and Quorra ever get back to the real world? The story plot could be hard to understand for younger children so I would recommend it to children and teenagers aged 12+. The film is probably best for boys because they would love to see all of the disc fights and light cycle races. There is a lot of action in this film, yet, some of the stunts may have a bad influence on young children. 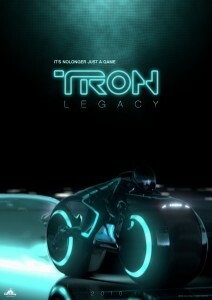 Music in the film is by Daft Punk and this suits TRON: Legacy perfectly.